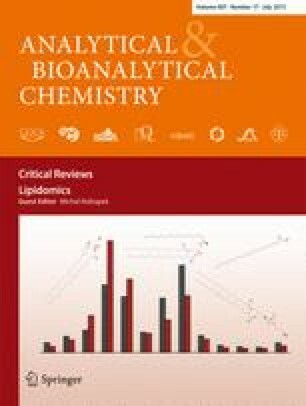 A method for localizing double bonds in triacylglycerols using high-performance liquid chromatography–tandem mass spectrometry with atmospheric pressure chemical ionization (APCI) was developed. The technique was based on collision-induced dissociation or pulsed Q collision-induced dissociation of the C3H5N+• adducts ([M + 55]+•) formed in the presence of acetonitrile in the APCI source. The spectra were investigated using a large series of standards obtained from commercial sources and prepared by randomization. The fragmentation spectra made it possible to determine (i) the total number of carbons and double bonds in the molecule, (ii) the number of carbons and double bonds in acyls, (iii) the acyl in the sn-2 position on the glycerol backbone, and (iv) the double-bond positions in acyls. The double-bond positions were determined based on two types of fragments (alpha and omega ions) formed by cleavages of C–C bonds vinylic to the original double bond. The composition of the acyls and their positions on glycerol were established from the masses and intensities of the ions formed by the elimination of fatty acids from the [M + 55]+• precursor. The method was applied for the analysis of triacylglycerols in olive oil and vernix caseosa. The online version of this article (doi: 10.1007/s00216-015-8537-1) contains supplementary material, which is available to authorized users. This work was financially supported by the Czech Science Foundation (Project No. P206/12/0750), the Academy of Sciences of the Czech Republic (RVO 61388963) and Charles University in Prague (Project SVV). The authors thank Dr. Miroslav Lísa for advices with the randomization synthesis.